EarthPulse Technologies, LLC develops PEMF agriculture application capable of substantially cutting germination time and increasing growth rate of sprouted seeds and beans, proving that directed magnetic field forces can increase yield by weight over 90%. Bangalore, India, April 11, 2006 --(PR.com)-- EarthPulse® Technologies announces results of controlled experiment utilizing their pulsed electromagnetic field system upon growth rate of sprouted seeds and beans. Over the course of many decades, professional and amateur botanists have researched the effect of magnetic and electromagnetic fields on plants. Their results were as diverse as the techniques used and have historically failed for lack of repeatability. 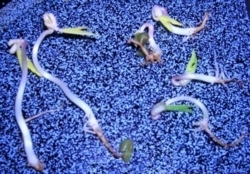 Seeds and beans soaked and sprouted under the influence of the EarthPulse® PEMF growing system grew far more robust than those sprouted without stimulation (see photo). Yield of mung bean sprouts was nearly doubled by weight, while yield of alfalfa sprouts increased by 42%. Taste was also significantly enhanced. “We routinely find that EarthPulse® enhances physiological healing processes better than any existing PEMF system, available anywhere, at any price. We believe this is though the EarthPulse® novel ability to promote cellular regeneration by mimicking naturally occurring magnetic fields. In addition our device is the first to prove that a weak PEMF field of proper frequency parameters can both substantially enhance sleep, and significantly improve daytime focus & learning,” said Paul F. Becker, Product Developer and Managing Partner. Because of scarcity of land, labor and water there is a shift from extensively farmed, mass-produced crops to intensive growing of high value niche products based on scientific and technological R&D. Today, technologically advanced growing methods are increasingly employed, including soil-less greenhouses with climate control systems. EarthPulse Technologies’ device and method of attaining more robust plant yield is perfectly suited for these high-tech growing environments. To learn more about this truly remarkable health breakthrough, visit the company website where you may browse an extensive database of more than 30 years of pulsed electromagnetic field (PEMF) medical journal studies and see amazing EarthPulse® video case studies of some of their clients. EarthPulse®, Better Sleep Means Better Health® and Sleep On Command® are registered trademarks of the inventor Paul F. Becker. EarthPulse Technologies, LLC is a privately held biotechnology company specializing in the use of very weak electromagnetic fields to induce deep, recuperative sleep, and enhanced mental & physical performance. Clients range in age from a 14 year old top ranked Girls Junior Tennis player, to men and woman well into their 80’s. EarthPulse® develops and manufactures in Bangalore, India and has several thousand satisfied clients in 15 countries.